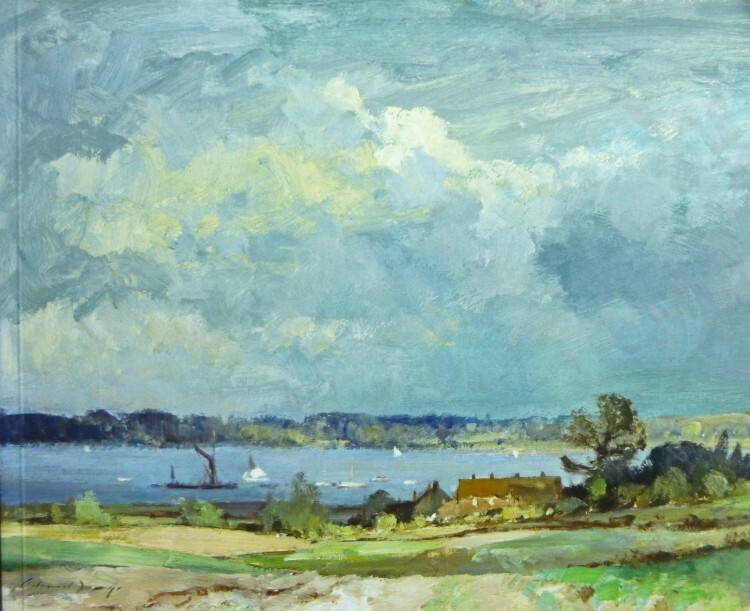 There are two Edward Seago exhibitions on in London at the moment – what a treat! One of my very favourite artists. Yesterday I met up with my sister, Jill and my niece, Claire, and we went to them both. In the morning – having risen above the torrential rain, and the fact that the train I had planned on taking was cancelled due to some unspecified faultiness – we went to the Portland Gallery. They have moved over the other side of Bennet Street since I was last there, which was a surprise. They are now at number 8, and their Seago show, with about 48 paintings fills the ground floor and the lower basement gallery – and is full of the most wonderful work. We particularly loved ‘October Morning, Horning’. The exhibition runs till 29th April. After lunch we splashed through the rain, up Cork Street and along New Bond Street to the Richard Green gallery at 147. Their show is smaller than the Portland’s, but filled with more wonderful paintings – and they have lots of lovely comfortable chairs so one can sit and look at the pictures in great comfort. One of my favourites here was ‘October Afternoon on the Thurne’, and I also specially liked ‘Landscape near Upton, Norfolk’, and ‘Calm Morning, Pin Mill’ and ‘June in Norfolk’. Although really it’s hard to choose, as I very much liked all of them! The photo above is from the front cover of the catalogue and is called ‘Cottages by the Orwell, Pin Mill’. The exhibition is on until 27th May. So! I’d highly recommend them both if you can get into London in the next few weeks. But be aware that neither gallery is open at the weekends. Google them to check out their opening times. We had a really lovely day, and also fitted in James Dodds’ show at Messum’s in Cork Street, and a quick whizz round Fortnum & Masons!